Margo Mateas is the creator of the Career Cards, the only career tool in the world to provide 70 Career cards that represent specific jobs, industries and career paths, and 18 Action and Block cards that tell you what to do in any situation. Career Cards answer questions about your life purpose and career path, but will also give you real insight into relationships, health, home life, spirituality and everything inbetween. Hailed as “amazing” and “uncannily accurate” by users all over the world, Career Cards are used by career and life coaches, therapists, recruiters, psychics, professional development counselors and individuals. They are currently used in 14 countries, including the United States, Canada, Mexico, France, England, Ireland, Scotland, Australia, New Zealand, Croatia, Bulgaria and Dubai (UAE). They are distributed internationally by New Leaf, the world’s largest metaphysical book distributor. 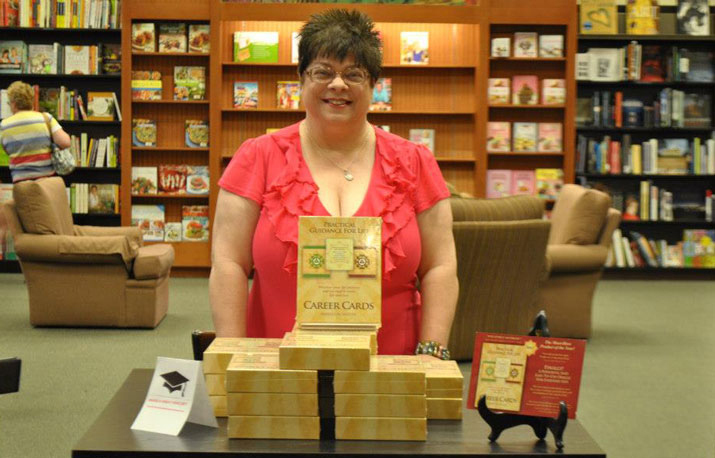 The Career Cards made their debut in December of 2012 and are now in their second printing, having sold out of 1000 copies in the first five months after their initial publication. 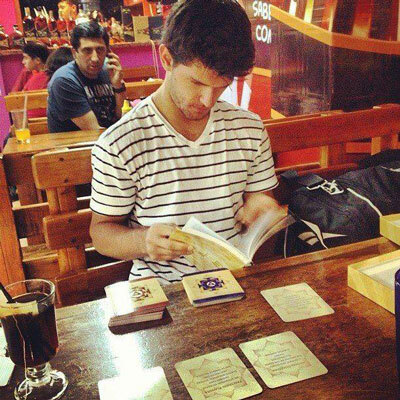 “The Career Cards flowed into my life right before my trip to Nicaragua (this is a picture of me using them there). After opening the box, several cards spit out of the deck at me. Two landed on the table, and the other two landed sideways against my leg. The rest of the pile was untouched. Needless to say, the four cards looking up at me held all the answers to what I needed at that moment. The book provides a hefty description for each card, and the best-kept insights lie in the text. And those insights WILL pop out at you. I was so scared they wouldn’t. But after reading the descriptions of each card, a specific motif (just for me) started to show itself. “In countries all over the world, to British TV, the Career Cards are changing lives and aligning people with their true life purposes. I count on the Career Cards to make decisions in my own life, and my radio show listeners are consistently blown away by how amazingly right-on the Career Cards are, every time." “Thank you so much for the set of Career Cards. When I opened them, I felt such a pure, crystal, loving energy. These Cards are really a gift to humanity. I got the cards the same day as my first painting lesson. I am sending you my first picture, painted with the help of my teacher. I will continue to take some more finger painting classes and we shall see. "We had the privilege of hosting Margo and her Career Cards in November of 2012. Over and over, I heard people exclaim, "Amazing!" "Wow!" and "Hmmm...I need to rethink my options" during their readings. As the day came to a close, I decided I would see for myself. Our business is going through a transitional period, and Margo did not know any details before she began my reading. But as the cards played out, the answers I received were all pointing to this period of change and guiding me forward with my plans. I was astounded. The cards were able to pick up on what was going on and confirmed what I knew I needed to do. "The Career Cards helped me when I lost my job suddenly. I was afraid I wouldn't get any job offers, but Margo and the Cards assured me that I was worthwhile, and that I would have several opportunities coming soon. To reassure myself, I posted the entire text of two of the cards around my house to remind me that good things were coming my way. Just as the cards predicted, I had a number of job offers within a few weeks, and ended up taking a job that paid more money than I was making before. The Career Cards really helped take me and my career to a whole new level of confidence." "The Career Cards will inspire you to discover your true purpose and to live the life you were always meant to live." "The Career Cards are a powerful and unique tool for making decisions and moving ahead in your life." "The Career Cards flowed into my life right before my trip to Nicaragua. After opening the box, several cards spit out of the deck at me. Two landed on the table, and the other two landed sideways against my leg. The rest of the pile was untouched. Needless to say, the four cards looking up at me held all the answers to what I needed at that moment. The book provides a hefty description for each card, and the best-kept insights lie in the text. And those insights WILL pop out at you. I was so scared they wouldn't. But after reading the descriptions of each card, a specific motif (just for me) started to show itself. They have a marvelous and magical appeal to them and are (and can be used) for anyone from the heavy tarot card educator to the 'new' beginner who is just feeling stuck and looking for a place to turn. They WILL provide an answer for you. In your life and in your biz/career or whatever work/impact you are making, and offer you that direction that is needed at that exact time. I will forever be grateful as to how these flowed into my life. And forever in gratitude (and confidence) that I am now on the right track to make the impact I am 'supposed' to make." "I've read the tarot for 25 years and welcome these cards to my tarot table! When my clients need expert advice regarding their current career or their life purpose, The Career Cards always come to the rescue with wisdom and insight. I recommend this deck for personal use as well. 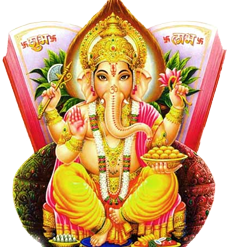 You don't have to know a thing about cards or readings to benefit from this spiritual tool."